We knew it was coming. We knew it would be flat. What we did not know is that once again Apple would make a great OS even better. Just like Apple always does with new products; it does not just catch up to features that were missing it innovates them as only Apple can. I have not been an Apple fanboy for a while truth be told I got board with the OS. It seemed that the Android could do so much more because it was open source. Each I wanted a feature, I had to go Cydia to find a tweak. For the non tech savvy folks, I don’t know how they do it. All my iDevices have to be jailbroken. It is a necessity for adding features that Apple simply does not have the time to add into a OS until it needs a boost. This is the case with iOS 7. Apple has once again taken it’s upgrades and features from the jailbreak community. 90% of the features introduced today are available right this moment on Cydia if you have a jailbroken phone. 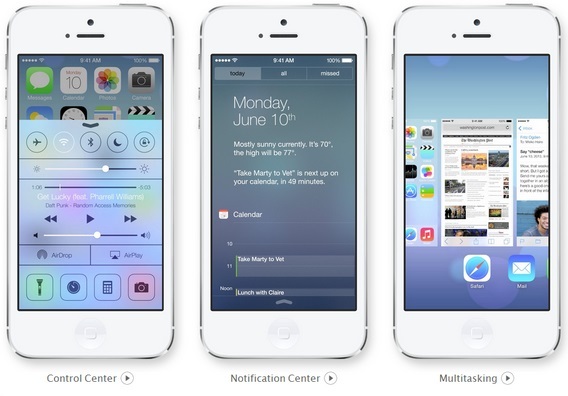 The new features and or upgrades were for Control Center, AirDrop for iOS, and smarter multitasking. Now lets go through the updates. Control Center gives you quick access to the controls and apps. You can switch to Airplane mode, turn Wi-Fi on or off, adjust the brightness of your display or use flashlight. One new feature that iOS 7 has that is not in the jailbreak community is it can learn when you like to use your apps and can update your content before you launch them. So if you tend to check Filpboard in the morning around the same time everyday it will have your feed ready and waiting for you. That’s a feature that will be very helpful. iOS schedules updates during power-efficient times. Like when your device is on and connected to Wi-Fi. So your battery isn’t drained unnecessarily. All the cool kids are doing it. So, why not Apple. You can now apply filters to photos. iCloud Photo Sharing now lets other people put thing in your Photo Stream.They can put photos, comments to your stream and finally videos. AirDrop is Apple’s answer to Samsung’s bump photo share feature. AirDrop lets you share photos, videos, contacts almost anything else from any app that supports the feature. Just tap Share, then select the person you want to share with. AirDrop will only work over Wi-Fi and Bluetooth. No setup required. And transfers are encrypted. Sorry Dropbox and Flickr, looks like Apple will be taking that business you. 1Password, it was fun while it lasted. Looks like Appple will be taking that buinness from you now. Or, maybe not. Now iCloud can remember your account names, passwords, and credit card numbers for you. Would you want this though? After all the talk of the NSA having a backdoor into Apple and a number of other big tech companies, I’d be hesitant to use this feature. It works on all your iOS 7 devices and your Mac computers running OS X Mavericks. Apple says that this is all done with 256-bit AES encryption. I’ll pass. Thanks. However, I will be using the Activate login needed if my iPhone is lost or stolen feature. iTunes Radio is here. After all the hype it’s just another Pandora. Social sharing is really lacking. What it is lacking it makes up in the iTunes walled garden. The more you listen to the radio the more it will be personalized. You have to scrub as with all streaming music services. iTunes Radio will be available on your iPhone, iPad, iPod touch, Mac, PC, and Apple TV for free. Checkmate? Only time will tell. What would be cool is if it could be combined with a Shazam type program. I have already been testing iOS7 on my iPhone 5 for the last day or two. Being truthful I fell somewhat tepid regarding the whole experience. After many years of design advancement exactly why have Apple made a decision to make their OS look like a poor cousin of Microsoft’s Windows 8. On the other side it seems to have borrowed heavily from Android. You can now swipe up to turn on/off WIFI, bluetooth, much like Android.To conclude I like: Newsstand, the inbuilt torch, screen transition, new compass interface and email interface. ngs menu is a bit of a waste land of white space. Just like an aging married couple I am finding more faults with it as time passes but I grow to love it the more time I spend with it.